The reputation of the B280F PRV V-6 is, and will continue to be the subject of ongoing debates between Volvo owners and enthusiasts alike. The engine was the result of a collaboration between Volvo and the French automakers Peugeot and Renault. The engine first appeared in the 1976 Volvo 264 sedan as the B27F, and over its 14-year tour with Volvo, the PRV V-6 has had a rather checkered reliability history. Its biggest problem, especially early on, was poor lubrication. If the oil was not changed regularly and frequently (every 2,500 to 3,000 miles), the oil passages to the head had a tendency to become blocked, leading to premature camshaft wear and eventual self-destruction. Over the years Volvo was making ongoing refinements to the V-6, and by the time the 780 was introduced it was fitted with a final version of the V-6 that was much more reliable than the earlier engines. It still requires frequent oil changes, and for this engine the process is a little more involved than usual, requiring the removable of the splash pan and a section of hose by the air cleaner box in order to gain access to the drain plug and filter. From a performance standpoint, the PRV V-6 is a little underpowered for the 780, with only 145 HP having to move an over 3400-pound car. The engine strains even further when running the air conditioning and under load. However, the V-6 has better low-end torque than the turbocharged 4-cylinder, and when properly tuned and maintained it is a very smooth and quiet running engine at cruising speeds—ideal for the touring application the 780 was originally designed for. Given the proper oil and coolant changes, the V-6 can often defy the accusations of “poor longevity”, with many satisfied owners reporting well over 150,000 miles on a well-maintained engine. The 780 Turbo was introduced at a time when Volvo was producing a more refined, reliable turbo engine, benefiting from intercooler technology and water-cooled turbochargers. Based on the ever-stalwart Volvo inline 4-cylinder, the 1989 turbos and the 1990-1991 “Generation 3” turbos are both perfectly reliable engines, given regular oil changes and proper idle intervals before engine shutdown. The “Generation 3” B230FT has the added benefit of increased performance and less “turbo lag” from the newer, smaller turbine in the turbocharger. Typical of the four-cylinder engines, the turbo transfers more vibration to the chassis and exhaust, causing the occasional rattling muffler. The engine is noisier under acceleration than the V-6, and can strain somewhat with accessories such as air conditioning running. Also, since the bulk of the turbo’s power is in the 3000-5000 rpm range, torque at low rpm is a little weak until the engine is sufficiently revved. However, the turbo offers much better performance than the V-6 and, besides proper oil change intervals, has less demanding maintenance requirements. The 760s and 780s were equipped with the Boge Nivomat self-leveling rear shock absorbers as standard equipment. This system employs the combination of a heavy-duty shock absorber and a lighter coil spring. The self-leveling feature is activated automatically by the normal up-and-down motion of the car’s suspension during driving, eventually raising the car up to normal ride height under empty or load conditions. If the car is not driven for several days, the rear of the Nivomat-equipped cars will naturally sag (usually within one inch of the rear wheels) due to the lighter springs. This is a normal characteristic of the Nivomat system and the car’s rear should eventually return to normal ride height after a period of normal driving. The Nivomat shocks can usually last up to 100,000 miles or more under normal wear and tear. But if the car’s rear is chronically sagging even after periods of driving, or fails the standard “bounce” test when physically pushed down, they may be due for replacement. Replacement Nivomat shocks are not cheap—as much as $450 retail or more per shock. However, if your 780 is a 1987 model which does not have the Multilink independent rear suspension, there is the option of replacing the Nivomats with standard shock absorbers. You will also need to install standard springs in place of the lighter springs, which came with the Nivomats. Unfortunately for 1988-1991 780s equipped with the Multilink IRS, there currently are no options available from Volvo for converting to standard shocks. IPD may have a kit to change these over to standard shocks but it does require changing the springs. However, I love the ride of my Nivomats! With a change only every 100K or so, it may not be worth the change over. Pay particular attention to the power seat switches (both driver and passenger). The original switches were in use since the 1983 760 GLE and were of poor quality up until ’88 or ’89 before they were improved. In a lot of cars you will most likely find a mixed bag of old and new switches as previous owners have had the broken ones replaced (or not). The original switches were all a square, inverted “T”-type design and were mounted in a recessed fashion into the side seat panel. The newer switches were of two different styles (see above photo). The switch controlling the angle of the seatback and the wider switch controlling horizontal position of the entire seat looked like the old “inverted T” type switches with slightly beveled edges. The two switches for the vertical adjustment of the seat bottom were a rounded, rocker-type design. The newer switches are all mounted in a slightly raised fashion, their bases flush with the seat panel. 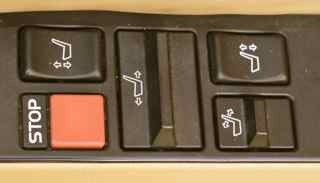 In 1990 and 1991 all Volvos with power seats were shipped with this specific combination of both the square and rounded-type switches installed. In fact, these different switch styles are accurately reflected in the owner’s manual illustrations! It looks sort of ad hoc, but this was probably to make it easy to determine, by touch, which switches controlled the horizontal and which controlled the vertical. The switches are expensive to replace (as usual), so bottom line: test them all thoroughly! Another problem area is the button on the side of either front seatback which allows you to fold it forward to gain access to the rear. This may in fact have been the same button used on the 2-door 240s. The button pulls a cable which releases the seatback, and over time the button can jam up or the cable can break, especially if the button and seatback are handled roughly. Also, the leather surrounding where the button is mounted has a tendency to tear, and can be visual evidence of rough handling of the seatbacks. The cable itself is expensive to have replaced. Volvo finally redesigned this in 1990 and converted it to a lever-type apparatus which is much more reliable and easy to use. One other note on the front seats: The 1989 through 1991 models have a “memory glide” feature. When the seatback is folded forward, the seat automatically moves all the way forward to facilitate entry to the rear. When it’s returned to the upright position, the user pushes down on the seat lever (or for the 1989s, a small button on the seat lever itself) and the seat returns to its original horizontal position. Like everything else with the seats, this too is motorized. The motors can get annoyingly slow after using them for awhile, but it’s a handy feature, nevertheless. old style visor 1987-1989. The 1987 through 1989 780s have an illuminated vanity mirror on the passenger’s sun visor only, and the lamp itself was a simple lens around the entire mirror with a small slider switch below the mirror. Starting in 1990, Volvo not only added a vanity mirror to the driver’s sun visor, but redesigned both of them with folding plastic covers, the idea being that the mirror light turns on automatically when the occupant flips up the cover. Once again, the quality of these visors was rather poor: the plastic mirror covers can break off quite easily, and in some cases the entire mirror assembly can fall (literally) into your lap when the sun visor is folded down. Volvo finally redesigned the visors for the 1992 960, so if the 1990 or 1991 780 you’re looking at has the older-style visors, insist they be replaced if they’re broken; or if they still happen to be intact, expect to replace them in the near future once they do break! The 780s have a front air dam design which rides lower to the ground than other 700 series models. Consequently, the air dam tends to receive damage from curbs and parking barriers fairly often. Cracked plastic, missing tow-hook covers, and bent fog lamp brackets are not uncommon in 780s whose air dams have hit curbs or parking barriers one too many times. When scoping out a potential 780, check under the front bumper to see how the air dam has held up. It may be possible to still buy one through your local Volvo dealer. I bought one in 2008 for less than you find them on ebay. The 780’s dashboard tends to begin showing small cracks or splits after six or seven years of regular wear and tear (exposure to sun, heat, cold, etc.). The cracking usually occurs on the passenger side, near and around the ECC sensor above the glove compartment (see above photo). Generally the cracks are not too distracting, however the damage could be more widespread and/or severe in cars which are abused or left out in the elements. Dashboard repair kits are available, although I’m not aware of how long the repaired area will last before the cracks reappear. You can also buy a replacement dashboard, but they are quite expensive. Many owners have opted for buying aftermarket fabric covers to place over the damaged dashboard. I bought my second Coupe out of Colorado with no cracks in the dash. One week in Texas and it had 3 cracks! I have been unable to find the vinyl replacement cover that is siliconed onto the dash. My guess is that there is not enough demand to make it profitable. The varnish on the wood trim also tends to crack or flake along the same timeline as the dashboard, and occurs particularly on the panels mounted on the face of the dashboard itself. With normal wear and tear the cracks are not that noticable, but wood trim which appears quite faded or has little varnish left usually indicates an abused interior. Depending on your location there are often specialty shops on hand who can repair or repolish damaged wood trim. It’s also possible to purchase replacement wood trim panels, but be prepared to open up that wallet! I have refinished a couple of sets. The door inserts come off easily after removing the panel but the dash requires extensive disassembly. If you need to refinish the dash trim, try to find some on ebay and refinish it first. Then just take the dash apart and swap it out. The 780 has two levers accessible along the door jam when the driver’s door is opened. One lever opens the trunk, and the other opens the fuel filler door. The fuel filler door may also be opened by pressing a rocker switch on the dashboard (with the ignition key inserted and set to “accessory”). The trunk can also be opened by pushing a button inside the glove compartment. There’s no other way to open the trunk and fuel door on the 780, so it’s important that these items are working properly. The door panels on the 780 are secured by screws in the armrests and along the bottom with two red plastic clips. The clips fit into the slots on the bottom of the door panel in a sort of odd fashion, and if not installed absolutely correctly the bottom of the door panel remains loose and can rattle. In addition, the clips themselves easily fall out if not correctly installed, so verify that they are all in place and that the door panel does not “give” when pulling on the armrest with the door closed. If the panel gives a little, the screws holding the panel to the door may need to be tightened. Fortunately, this actually is not too much of an issue with the 780. By the time the 780 was introduced, Volvo had already begun using galvanized steel and a special zinc-enriched paint process in its manufacturing, making the body of the 780 and the rest of the model lineup much more resistant to corrosion. One area which seems to begin to show some surface rust is the” lip” of the opening in the car’s roof which holds the moonroof, perhaps attributed to water seeping through the gasket around the moonroof itself. So when you look at a prospective car, open the moonroof and take a look for rust. Another location to check is the area at the bottom of the rear side windows. If you see rust here, you have some significant rust behind the rear side interior panels. I wrote up the fix for this, which can be found on the FAQ of the Brickboard. 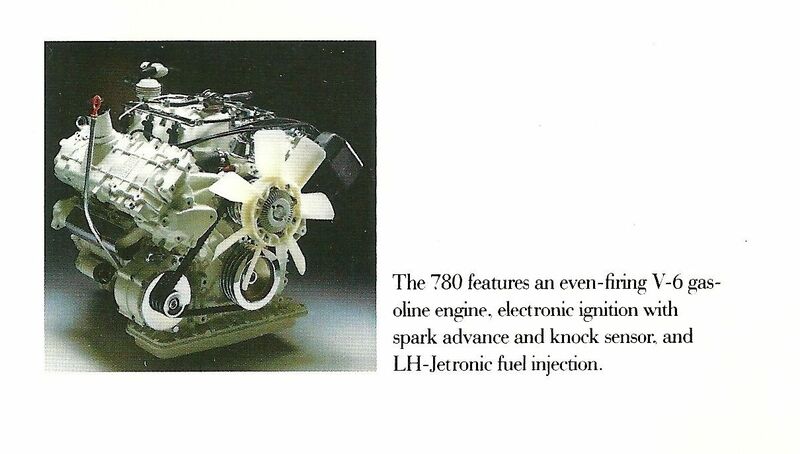 This is a minor but chronic problem area for the 780 (and other 700 series sedans of similar vintage). The original plastic housings for the license plate lamps had metal clips holding the assembly to the underside of the trunk lip. The clips rust out fairly quickly in a few years, causing the housings to become loose up to the point that they simply fall out of their mountings! The replacement housings have thicker gaskets and black-painted metal clips, to hopefully retard the effects of corrosion. As compared to the 200 Series Volvos, which have a near 50/50 front-to-rear weight distribution, the 700 Series Volvos are a little heavier in front, and the 780 is no exception. Traction in snow and ice is also compromised by the wider, high-performance tires. It is highly recommended that 780 owners who drive their cars in the winter invest in a good set of winter tires for all four wheels. Combined with the 780’s 3,400+ pound weight, the narrower, high-traction winter tires will significantly improve the 780’s road handling in snow or ice, making the 780 a very capable winter vehicle. 1991 cars also have the added advantage of a limited-slip differential. Some owners have added additional ballast in the rear (sand bags or an equivalent), but I personally have not found this to be as critical a requirement for 780 winter driving. While sharing nearly all mechanical and electrical components with the 760 Series cars, miscellaneous parts for the 780 such as trim pieces, body mouldings, and head or taillamp assemblies demand a premium price—thanks to the 780’s limited edition status. 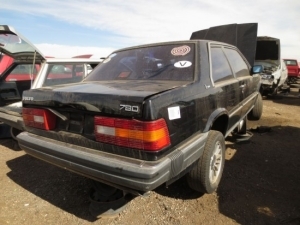 There are some Volvo shops selling some used 780 parts, and you might find the occasional example in a salvage yard, but they are few and far between. In most cases, you will be forced to buy the specialty parts new. There are, however, enough shops selling new parts at a discount, so the hit to the pocketbook isn’t quite as bad. Availability is becoming more of a problem. Even ebay has little in the way of body parts. If you can find a parts car and have a place to store it, that might be a good idea (although the interiors are usually a mess). Most of us do not have a place for it so collect a few critical parts when you find them (lights, grill, interior, fenders, bumpers, etc). The 780s, along with their own unique quirks, are just as susceptible to the occasional quality hiccups and problems that are suffered by the other 700 Series cars. In addition, there will always be a few bad or abused examples out there, so approach a prospective 780 with at least the same (if not higher) level of scrutiny as any other late-model used Volvo. It should be readily apparent from just a preliminary visual inspection of the car if it has been abused or improperly maintained, particularly in the interior. Starting and driving the car should reveal its overall mechanical condition. Verify that the car’s maintenance records are present—they will give you a pretty good idea of how well the car was maintained. Be wary of cars which do not include their full maintenance history.